"To John Morris is alloted one piece of land in Thorpe Field about the windmilkl belonging to the said John Morris and surrounded by lands alloted to William Thompson containing 25 perches." This was being worked by WIlliam Ford and his son John according to the 1851 censsu. Between 1890 and 1916 Joseph Handy was the miller. It was demolished in 1950. 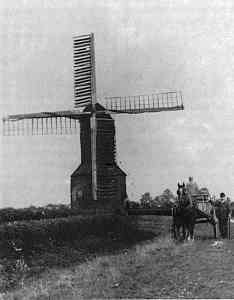 Wysall Lane windmill; date unknown. A second windmill stood clsoe to the present Mill Cottage on Wysall Lane (OS Grid ref 6048 2420) and it belonged to the lords of the manor (Messrs Davys and Allsop) and the land surrounding it was alloted to them by the Enclosure Award. On Burton Road a third windmill appears on the 1836 OS map approximately opposite the present entrance to the industrial estate (OS Grid ref 6970 2205). It was for sale in 1844 and shown again on the 1883 map. I was browsing through some of the articles on the WHO web site and came across the Wymeswold Windmills article. Having both a map reference and a description of their location is very useful is visualising where they stood, with the eight digit map reference pinning the spot to within 10 metres. However I believe there are a couple of errors in the articles in relation to their locations, as the OS grid references do not match the described locations. The OS grid reference in the article (6970 2205) would position the windmill at the corner of a field just off Ostler Lane Saxelby Pastures, while the description says it was east of Burton Lane. After looking at the OS 6 inch to mile map surveyed 1883, I believe the description of the mill's location is correct but the map reference should be SK59702202 (the prefix letters to the map reference should also be included). This would place the mill about 180 metres from the road in the middle of the field at the back of Leeclose Cottage. Its exact location is ambiguous as the hedges surrounding the mill have been removed. I don't believe the map grid reference in the article (6065 2410) accurately reflects the position of this windmill. The National Library of Scotland facility to overlay historic maps over satellite aerial photographs, shows the windmill to be about 70 metres from the road. I believe this puts its location just to the north of the low barn next to the footpath off Wysall Lane at SK60572410, rather than in the corner of the field. The map reference (6048 2420) given in the article is that of Mill Cottage on Wysall Lane. However the complete map reference would be SK60482420. As referred to in the article this mill does not appear on historic Ordinance Survey maps. In the light of the above I would be grateful if you could make arrangements for the following corrections to be made to the online article.